For the past few months, I've been back and forthing on a way to get this to look half-assed on the 3DS. The slow-to-react LED is causing really horrible "clarity" issues. When you moved, the stars turned to a dark grey whilst the screen tries to catch up. If you stopped, and it has time to draw them fully, they become hard and white. The constant difference in clarity, jumping between white and grey as you move/stop, was causing MASSIVE issues whilst I was trying to play it. I've tried a number of solutions, but this one seems to be working well enough. The stars are now quite chunky, so when in motion they draw across about 2 or 3 pixels, thus leaving less of a fuzz behind them. They're then overlayed with a dark pattern which helps to reduce the fuzz a little further. 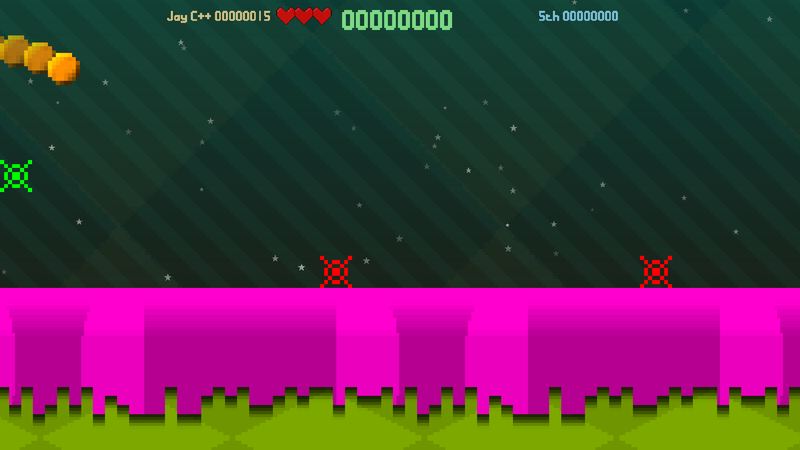 I think I'm finally happy with the way it's looking, and have decided to go ahead and create "SpikeDislike Classic".